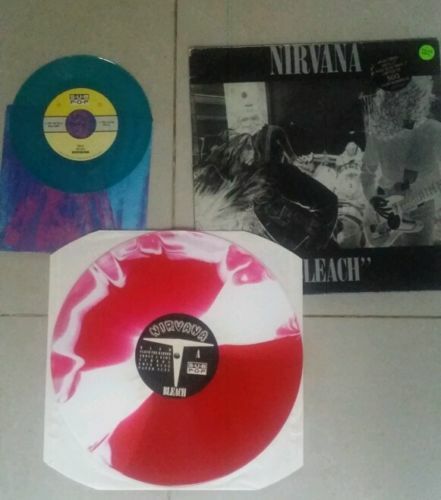 Up for sale is my treasured and super rare Nirvana Bleach Original 1989 LP on the famous red and white vinyl , complete with the additional 7" single of Sliver on the equally rare blue vinyl. The stickers are still intact and shows that this one one is number 082 of a limited edition run of 500 worldwide. I've never played either of the discs since I got them about 10 years ago. They have been properly stored in vinyl protective sleeves. The cover has slight creating on the corners but no tears . IT DOES SAY "MAKE AN OFFER". SO TRY ME. AND PIXIES64, if you could get in contact, we can work something out.